The winter and spring of 1997 were extremely dry seasons due to the effects of El Nino. 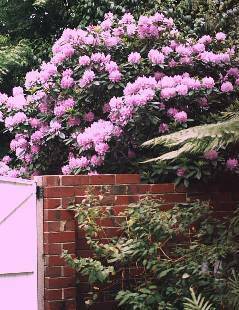 Many of the less hardy plants in the garden suffered considerably but some, like this beautiful, delicately shaded, mauve Rhododendron still managed to put on a good show. This was our first spring at Lawson Avenue and each new flowering or sudden show of growth or color was a great adventure for us. This 1998 winter/spring the rains have fortunately returned and already the gardens are looking all the better for it. There is still a long way to go before our gardens look as well as they could do. It takes time for plants to recover from the stresses of water shortage but we are hopeful that this year the blooms of this particular plant will be even more spectacular than ever.